After watching a military documentary when he was 13-years-old, Matthew Wheeler’s future plans were set – he knew he wanted to serve. Matthew also has a family history of military service – his grandfather was in the Army for 30 years, and both his parents were in the Air Force. However, Matthew is the first in his family to become a Marine. On June 18, 2011, during his fourth deployment as an explosive ordnance (EOD) technician with the 1st Battalion, 5th Marines, Staff Sergeant Wheeler was on a patrol crossing a canal when he noticed the corpsman was struggling. 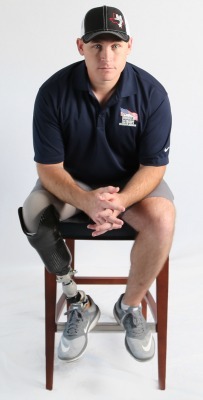 As he turned around to help the corpsman, SSgt Wheeler stepped on an improvised explosive device (IED), causing the bones in his right leg to break and his heel bone to shatter. SSgt Wheeler says he is grateful he was the only one injured in the blast. After years of dealing with unbearable pain in his injured leg, doctors diagnosed Matthew with complex regional pain syndrome, a condition that causes extreme sensitivity, burning pain, swelling, and stiffness. After trying several unsuccessful treatments for the pain, Matthew elected to have doctors amputate his right foot. The surgery removed the pain in Matthew’s right leg, and he now wears a prosthetic and is off most of his medication. Even though Matthew has made significant progress, he still experiences daily pain and uses a wheelchair when he is at home. Since his current home is two levels, he cannot go upstairs to tend to his children or put them to bed at night. This causes his wife Emilee to take on much of the childcare responsibilities. In a single-level Homes For Our Troops home with an open floor plan and wide hallways and doorways, Matthew will be able to help Emilee around the house and care for his children. Without the burden of a mortgage, Matthew will have more time to further his education to progress his career as an investor account manager for the startup company ListingSpark. Regaining this independence and freedom within his own home will also open up more time for his other hobbies. He is involved with his church, running the security team for the building and mentoring teenagers. He would also like to help more with Patriots and Heroes Outdoors, which takes injured Veterans on hunting and fishing trips. Originally from Texas, Matthew and his family are choosing to remain in the Lone Star State to be close to their family and church.